The anatomical location of the duodenum makes diagnosis and treatment of isolated duodenal injury a difficult task. Due to its rarity and subtle clinical features, the diagnosis and management is often delayed. We describe two patients with isolated blunt duodenal injuries and highlight some problems and principles in the management of duodenal injury. A 14-year-old boy had a fall from a bullock cart. He was initially managed in two private hospitals where he underwent a laparotomy and duodenorrhaphy for traumatic duodenal perforation 30 hours after injury. On the 6 th postoperative day (POD), he was referred to our hospital with high-grade fever, altered mental status, abdominal distension and bilious discharge from the laparotomy wound. Hematological investigations revealed thrombocytopenia with features of disseminated intravascular coagulation (DIC). After adequate resuscitation and stabilization, the patient was taken up for re-laparotomy. 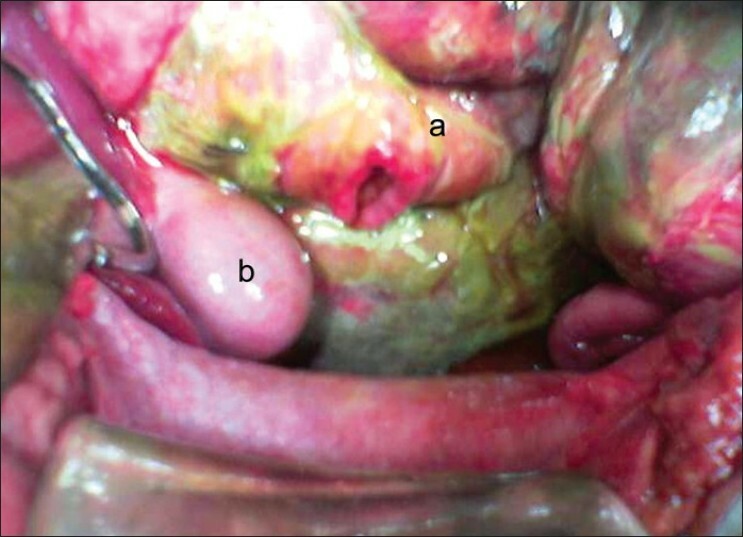 The peritoneal cavity was filled with bilious fluid and there was crepitus along the paraduodenal and paracolic area. The previous repair was seen intact on the anterior wall of the second part of the duodenum. On mobilization (Kocherization) of the duodenum, another perforation of size 1.5 cm was discovered on the posterior wall of the second part of the duodenum. The perforation was repaired in two layers and a triple tube decompression, i.e. tube gastrostomy, reverse tube duodenostomy and a feeding jejunostomy, was performed [Figure 1]. An abdominal drain was placed in the paraduodenal area and a polypropylene mesh laparostomy was done. A contrast study on POD 15 showed normal passage of contrast into the jejunum, with no leak from the injury site. Though he had one episode of fever, he was finally discharged on POD 88 in a stable condition. A 21-year-old male had a fall from a scooter. He attended the emergency department in a stable condition, and after primary assessment, the attending physician discharged him. The patient returned to the emergency department with abdominal pain and vomiting 24 hours after discharge. On examination, he was conscious, afebrile, with pulse rate 110/min and a blood pressure of 90/60 mm Hg. There was tenderness in the upper abdomen. Serum amylase was 65 U/L (reference range 95 U/L); total leukocyte count was 11,000/mm 3 (reference range 4000-11,000/mm 3 ). Plain abdominal and chest radiographs were normal. Contrast-enhanced computed tomography scan of abdomen with intravenous and oral contrast media revealed free gas in the retroperitoneum, extravasation of contrast and free fluid in the abdomen. The patient was taken up for emergency exploratory laparotomy. There was bile staining and crepitus in the paraduodenal area and nearly 200 mL of dirty fluid in the right paracolic gutter. Complete kocherization (mobilization) of the duodenum was done. There was a perforation in the second part of the duodenum involving more than 50% of the circumference [Figure 2]. Duodenorrhaphy was done in two layers with 3-0 vicryl and silk sutures. A tube gastrostomy, reverse tube duodenostomy through the proximal jejunum, and a feeding jejunostomy and polypropylene mesh laparostomy were performed. He was discharged home on POD 42. We performed a polypropylene mesh laparostomy in both the patients, since a safe definitive closure of the abdominal wall was not feasible due to tension and a primary closure could have resulted in the development of an abdominal compartment syndrome. Instead, a transparent low-cost plastic sheath (unprinted side of a sterile urine collection bag) was placed between the abdominal wall and the exposed viscera. An appropriate size of a plain polypropylene mesh was then sutured to the linea alba to cover the abdominal contents without tension. After 48 hours, the plastic sheath was gradually removed through the caudal end of the laparostomy. As the abdominal distension decreased, the polypropylene mesh was divided in the midline and gradually trimmed over several days. Each time the mesh was trimmed, the cut edges of the mesh were re-sutured with 1-0 polypropylene suture to maintain the continuity of the mesh. Here, we have described two patients with duodenal perforation following blunt abdominal trauma. In both the patients, the diagnosis was delayed. In the first patient, a second perforation was found during re-laparotomy. In the second patient, the diagnosis was made 24 hours after the first discharge. Both of our patients were effectively managed by simple repair and duodenal decompression by triple tube technique. 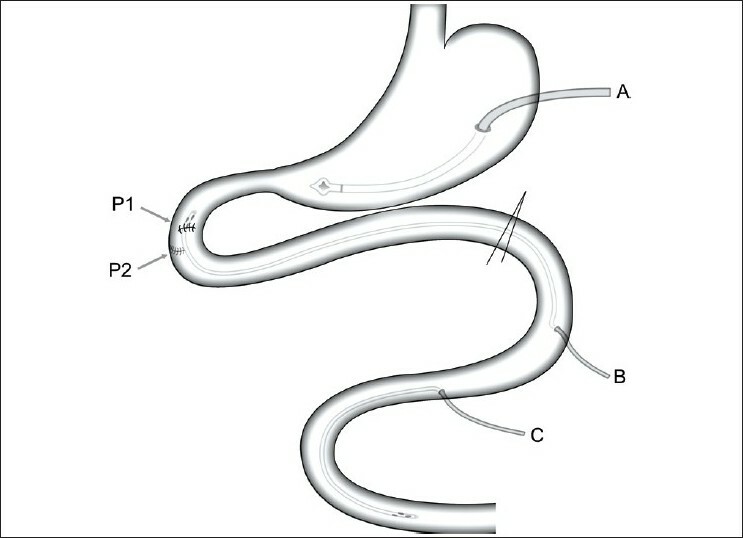 Simple repair followed by duodenal decompression with triple tube technique was originally described by Stone and Fabian. This triple tube technique comprises a tube gastrostomy for decompressing the stomach, a reverse tube duodenostomy for duodenal decompression and an antegrade tube jejunostomy for enteral feeding [Figure 1]. For reverse tube duodenostomy, the tube is passed through the proximal jejunum and guided into the second part of duodenum. This triple tube technique is rapid, needs only basic surgical experience, and provides a portal for early enteral feeding obviating the need for intravenous hyperalimentation. Thus, it is a cost-effective option with least morbidity for managing these severely injured sick patients. In our first case, the injury on the posterior wall of the duodenum was missed at the time of the first laparotomy. The obvious perforation on the anterior wall probably prevented the operating surgeon from proper mobilization (Kocherization) of the duodenum. In the second patient, the index of suspicion for severe internal injury was low in view of absence of clinical signs, hence the patient was discharged. Mobilization of the duodenum is known to reveal significant injury even in the absence of apparent signs of trauma on it. Recently, Zeliζ et al. reported a case of complete transection of the duodenum at two places, one just beyond the pylorus and the other between the second and third part of duodenum. This report, as well as our first case, highlights the possibility of duodenal injury occurring at multiple sites. We strongly suggest that in all major blunt trauma cases, even in the presence of obvious perforation on the duodenum, the duodenum should always be mobilized and evaluated for additional injury. Another option to manage such patients could have been a controlled duodenal fistula following peritoneal lavage. However, we preferred triple tube decompression as the feeding jejunostomy associated with the procedure helps in early enteral feeding, thereby avoiding the need for more expensive total parenteral nutrition (TPN) with its attendant complications. The mesh laparostomy prevents evisceration of gut and the abdominal compartment syndrome. It also facilitates drainage of infectious material, permits visual control of the underlying viscera, facilitates wound care, simplifies repeated exploration if required, and hastens healing by secondary intention. Isolated duodenal injury following blunt abdominal trauma is rare; therefore, most general surgeons have a low index of suspicion and may not be experienced in handling such problems. These two cases highlight the difficulties that can be encountered during diagnosis and management of blunt abdominal trauma with isolated duodenal injury. The diagnosis depends on a high index of suspicion not only during the initial clinical evaluation but also during trauma related laparotomies. When diagnosed late, especially when the patient's general condition is severely compromised, simple duodenorrhaphy with duodenal decompression by triple tube technique may be a good selection because the procedure is simple, rapid, and provides a portal for early enteral feeding. The authors thank Mr. Pirmin Storz, Section for Minimal Invasive Surgery, University Hospital Tuebingen, Germany, for his technical help in the preparation of the graphic illustration, and Prof. Shaji Thomas, Department of Surgery, Lady Hardinge Medical College, New Delhi, for his expert help in the editing the manuscript. 1. Allen GS, Moore FA, Cox CS Jr, Mehall JR, Duke JH. Delayed diagnosis of blunt duodenal injury : a0 n avoidable complication. J Am Coll Surg 1998;187:393-9. 2. Bozkurt B, Ozdemir BA, Kocer B, Unal B, Dolapci M, Cengiz O. Operative approach in traumatic injuries of the duodenum. Acta Chir Belg 2006;106:405-8. 3. Blocksom JM, Tyburski JG, Sohn RL, Williams M, Harvey E, Steffes CP et al. Prognostic determinants in duodenal injuries. Am Surg2004;70:248-55. 4. Velmahos GC, Constantinou C, Kasotakis G. Safety of repair for severe duodenal injuries. World J Surg 2008;32:7-12. 5. Ballard RB, Badellino MM, Eynon CA, Spott MA, Staz CF, Buckman RF Jr. Blunt duodenal rupture : A0 6-year statewide experience. J Trauma 1997;43:229-32. 6. Rickard MJ, Brohi K, Bautz PC. Pancreatic and duodenal injuries : K0 eep it simple. ANZ J Surg 2005;75:581-6. 7. Osuka A, Idoguchi K, Muguruma T, Ishikawa K, Mizushima Y, Matsuoka T. Duodenal disruption diagnosed 5 days after blunt trauma in a 2-year-old child : R0 eport of a case. Surg Today 2007;37:984-8. 8. Degiannis E, Boffard K. Duodenal injuries. Br J Surg 2000;87:1473-9. 9. van Ginhoven T, Schepers T, Obertop H, van Eijck CH. Delayed closure of complex duodenal Injuries by a Foley balloon catheter duodenostomy. Dig Surg 2006;23:150-3. 10. Crippa S, Falconi M, Bettini R, Barugola G, Germenia S, Salvia R, et al. Isolated blunt duodenal trauma : d0 elayed diagnosis and favorable outcome with "quadruple tube" decompression. JOP 2007;8:617-20. 11. Stone HH, Fabian TC. Management of duodenal wounds. J Trauma 1979;19:334-9. 12. Flint LM Jr, McCoy M, Richardson JD, Polk HC Jr. Duodenal injury. Analysis of common misconceptions in diagnosis and treatment. Ann Surg 1980;191:697-702. 13. Zeliæ M, Kunisek L, Petrosiæ N, Mendrila D, Depolo A, Uraviæ M. Double transection of complete duodenal circumference after blunt abdominal trauma without other intra-abdominal injuries. Wien Klin Wochenschr 2010;122:54-6. Kutlu, O.C. and Garcia, S. and Dissanaike, S.
Cienfuegos, J.A. and Rotellar, F. and ValentÃ­, V. and Arredondo, J. and Baixauli, J. and Pedano, N. and Bellver, M. and HernÃ¡ndez-Lizoain, J.L.